Map of Maine Lobster Shacks! Great Places for Lobster. 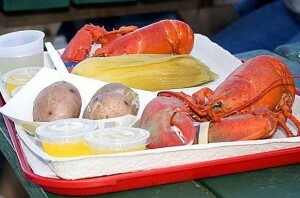 You may also want to see our 2012 update, Secret Lobster Shacks of Maine, with more info, photos, and an updated map! Update: We’ve received suggestions for additional spots, so we’ve removed the “12” from the title, as that number is no longer correct – there are more! Not too long ago we wrote a post about lobster in Maine (Visiting Maine Part 4 – Lobster, Lobstah, Ahhh, Heaven). In that post we mentioned an article from Travel + Leisure magazine from a few years ago, called “10 Best Lobster Shacks in Maine.” We noted that a couple of our favorites were missing from the list. We’ve also posted previously about the seasons for lobster, hard and soft shells, etc., in a recent post. Little did we know, but Travel + Leisure has updated that article with a June, 2009 version of “10 Best Lobster Shacks in Maine.” There are some wonderful places for lobster in that article, but we still think they’re missing some good ones. If we missed your favorite lobster shack or restaurant, please let us know in the comments and we’ll see if we can add it for future reference. Great list! How about Cindy’s on Rt 1 and Linda Bean’s in Freeport and Port Clyde! Just checked, as I thought I had replied to the comment about Thurstons, but I did add it to the map back in July. Sorry for not mentioning it! I’ve also added the Lighthouse Lobstershack – please check the location, as the map placed the address farther up Old Bath Road, but I know I’ve seen it driving past, so I think I have the right location. What a great post! Just one suggestion:If you add some pics, it would be easiler to follow! Good suggestion about the pictures! Next time we go past some of them, we’ll have to take some photos.